Nominations for AANA elected offices and consent forms from nominees are due in the AANA office by December 1, 2017. CRNAs and other eligible professionals (EPs) may now access their 2016 PQRS Feedback Reports and 2016 Annual QRURs through the CMS Enterprise Portal. The PQRS Feedback Reports show 2016 PQRS reporting results, including whether you are subject to the 2018 PQRS downward payment adjustment. The 2016 QRURs show solo practitioners and EPs in group practices their performance on the quality and cost measures used to calculate the 2018 Value Modifier. An Enterprise Identity Management (EIDM) account with an appropriate role is required for EPs to obtain their 2016 PQRS Feedback Report and 2016 QRUR. CRNAs and other eligible professionals (EPs) may request an Informal Review of their 2016 PQRS Feedback Reports and/or 2016 Annual QRURs if you believe that your payment adjustment status was made in error and have incorrectly been assessed a penalty. The 2016 PQRS Feedback Reports and 2016 Annual QRURs are now available through the CMS Enterprise Portal. CMS will accept a request for a 2016 PQRS informal review until December 1, 2017 at 8 p.m. Eastern Time. 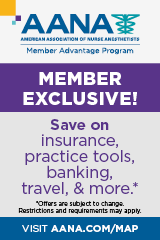 If you're looking to purchase health insurance during the Affordable Care Act (ACA) Open Enrollment Period, check out what AANA Member Advantage Program partner AHIX has to offer. (The Open Enrollment Period lasts from November 1, 2017, to December 15, 2017.) You'll find savings and plenty of new options to fit your needs, including PPOs, access to doctors and hospitals throughout the United States, and lower deductibles and out-of-pocket costs. Affordable Care Act plans are also available (online only). Go to AHIX.com or call (888) 624-5870. The U.S. Food and Drug Administration (FDA) launched a new user-friendly search tool that improves access to data on adverse events associated with drug and biologic products through the FDA’s Adverse Event Reporting System (FAERS). The new FAERS public dashboard enables users to search for and organize data by criteria such as drug/biological product, age of the patient, type of adverse event, year the adverse event occurred, or within a specific timeframe. The FDA is committed to improving transparency of adverse events reported with medical products and this enhanced portal now provides patients, clinicians and others with easier access to the data they are interested in. The National Academies of Sciences, Engineering, and Medicine has released a new report titled "Pain Management and the Opioid Epidemic: Balancing Societal and Individual Benefits and Risks of Prescription Opioid Use," which updates the state of the science on pain research, care and education; describes the epidemiology of the opioid epidemic; identifies response strategies for the FDA and other organizations; and identifies research questions to assist with the response effort. Download a free version of this report. Review the major physiological concepts underlying the components, their major functions, and common disorders associated with the alteration of cells derived from bone marrow. Earn two Class A CE credits with Physiology of the Hematologic System: Blood Cells and Hemostasis – now available on AANA Learn®. AANA Members save 30 percent. At Annual Congress, the Board of Directors reaffirmed three position statements. The Role of the CRNA on the Procedure Team affirms that when anesthesia services are requested for a procedure, there should be at least three qualified healthcare providers involved: the proceduralist, a qualified anesthesia professional, and an assistant to the proceduralist. A diagnostic procedure (e.g., MRI, CT scan) may only require two qualified providers. Additionally, the position statement affirms that AANA does not advise that a CRNA function in a traditional RN role. Expert Witness for Nurse Anesthesia Practice affirms that CRNAs are qualified to articulate current professional standards and explain technical concepts as part of expert testimony in various situations. The position statement also provides considerations for CRNAs who serve as expert witnesses. The Practice of Anesthesia affirms that the practice of anesthesia has been a recognized nursing specialty for more than 100 year. Anesthesia is not the exclusive practice of nursing or medicine, but falls within the scope of practice of both professions. Join the Council on Patient Safety in Women’s Health Care for a complimentary webinar on Tuesday, October 17 at 2 p.m. ET, discussing methods and best practices for using shared decision-making to empower patients and engage in care. Register here for the webinar. Register now for the following meetings and workshops. February 15-17 Scottsdale, AZ Save the date! Gifts to political action committees are not tax deductible. Contributions to CRNA-PAC are for political purposes. All contributions to CRNA-PAC are voluntary. You may refuse to contribute more or less than the guidelines suggest and the association will not favor or disadvantage you by reason of the amount contributed or the decision not to contribute. Federal law requires CRNA-PAC to use our best efforts to collect and report the name, mailing address, occupation, and the name of the employer of individuals whose contributions exceed $200 in a calendar year. All contributors must be US citizens. Undiagnosed obstructive sleep apnea (OSA) is known to up the risk of complications following surgery. Canadian researchers performed a systematic review and meta-analysis in order to compare this association in high-risk OSA patients as opposed to low-risk OSA patients. A database search from Jan. 1, 2008, to Oct. 31, 2016, yielded 10 relevant cohort studies, with an aggregate study population of 7,877 high-risk patients and 15,732 low-risk patients. The study revealed a nearly four-fold greater likelihood of perioperative complications in the high-risk group, who also spent two days longer in the hospital than their low-risk counterparts. Based on the apparent elevated risk of postoperative adverse events and prolonged hospitalization in high-risk versus low-risk patients, investigators say the findings support the use of the STOP-Bang questionnaire as a way to identify and stratify this risk. The validated method—which uses traits including body mass index, neck circumference, age, gender, and hypertension to gauge risk—has recently been promoted by the Society of Anesthesia and Sleep Medicine for preoperative screening. From "Association of STOP-Bang Questionnaire as a Screening Tool for Sleep Apnea and Postoperative Complications"
Anesthesia & Analgesia (10/17) Vol. 125, No. 4, P. 1301 Nagappa, Mahesh; Patra, Jayadeep; Wong, Jean; et al. Microsurgical breast flap reconstruction can now be added to the list of procedures that benefit from enhanced recovery after surgery (ERAS) protocols, thanks to the work of researchers at New York City's Memorial Sloan Kettering Cancer Center. Their study—involving 91 patients—compared outcomes with and without an ERAS protocol developed by Anoushka Afonso, assistant professor of clinical anesthesiology at Memorial Sloan Kettering. Some of the plan's key components included multimodal pain management, transversus abdominus plane (TAP) block with liposomal bupivacaine, and goal-directed fluid management intraoperatively. The Kettering team found that the 42 patients who followed the ERAS plan used 46 mg of morphine equivalent postoperatively, compared with 70.5 mg for the 49 patients who received standard care. The mean hospital length of stay was five days for the controls, a full day longer than the ERAS group. "I think this is going to be the new standard," Afonso surmised. "I think that enhanced recovery, and the mere fact that people are paying attention, communicating with each other about their patients and incorporating a standardized approach with decrease complications, allow for improved patient flow and improve outcomes." From "ERAS Protocol Succeeds in Breast Flap Reconstruction"
New evidence suggests that thoracic epidural analgesia (TEA) offers a number of positive outcomes following hepatopancreatobiliary surgery. In a sample of 140 patients—106 randomized to TEA and 34 assigned to intravenous patient-controlled analgesia—freedom from pain scores were markedly higher in the TEA group. These patients also required less daily opioid medication for most of postoperative days 0 to 3. Additionally, they experienced fewer postoperative complications than control patients. The findings are reported in the Annals of Surgery. From "Thoracic Epidural Analgesia Effective After Multi-Organ Surgery"
Industry research has unveiled the first evidence that administering multiple-dose parecoxib upon recovery from anesthesia provides effective analgesia and curbs the need for narcotic painkillers following major gastrointestinal (GI) surgery. The benefits have already been demonstrated for minor GI operations along with gynecologic, orthopedic, and other types of procedures. The new analysis, meanwhile, looked at various outcomes in a population of patients who received either parecoxib or placebo following major GI surgery requiring laparotomy. The parecoxib patients received an initial dose on day one, with additional doses every 12 hours after that through at least day three; and all patients received morphine patient-controlled analgesia. On days two and three post-surgery, the 111 participants in the active-treatment group expressed much lower pain scores and pain interference than did the 126 participants in the placebo group. They also required 45 percent, 41 percent, and 40 percent less supplemental morphine at 24, 48, and 72 hours, respectively, than the placebo-takers. This outcome was especially important for major GI patients, as opioids can trigger nausea, vomiting, and constipation. Moreover, the risk of opioid-associated fatigue and drowsiness was substantially lower in patients taking parecoxib. At the same time, Patient and Physician Global Evaluation of Study Medication scores were markedly better for them. From "Parecoxib Relieves Pain and Has an Opioid-Sparing Effect Following Major GI Surgery"
International Journal of General Medicine (2017) Vol. 2017, No. 10, P. 319 Essex, Margaret Noyes; Xu, Hao; Parsons, Bruce; et al. Through a randomized study, Ethiopian researchers explored whether intravenous tramadol or low-dose I.V. ketamine might curb the frequency of shivering after cesarean section. The complication often occurs following spinal anesthesia as the body struggles to increase metabolic heat production; but it can contribute to a number of adverse events, from higher intraocular and intracranial pressures to increased wound pain to myocardial ischemia. To investigate, the team from Addis Ababa University and the University of Gondar assigned 41 laboring women to receive ketamine, 41 to receive tramadol, and 41 to receive a control infusion of saline. Shivering was reduced by 53.7 percent among the tramadol patients and 41.5 percent among the ketamine recipients compared with the control group. Grade 3 shivering affected 19.5 percent of the women who received ketamine, 22 percent of those who received tramadol, and 39 percent of those who received saline. Grade 4 shivering occurred only among the saline patients, two of whom were affected. Based on the results, the investigators found that 0.2 mg/kg of I.V. ketamine or 0.5 mg/kg of I.V. tramadol both offer prophylaxis against shivering associated with spinal anesthesia for cesarean section. They are a viable alternative to force air warmers, blankets, and radiant heat strategies—which are both costly and cumbersome. From "Efficacy of I.V. Tramadol and Low-Dose Ketamine in the Prevention of Post-Spinal Anesthesia Shivering Following C-Section"
International Journal of Women's Health (09/17) Vol. 2017, No. 9, P. 681 Lema, Girmay Fitiwi; Gebremedhn, Endale Gebreegziabher; Gebregzi, Amare Hailekiros; et al. A retrospective study has discovered that children aged six months and older who undergo nasal intubation for anesthesia are more vulnerable to infection and other complications. The Duke University researchers tapped the Society of Thoracic Surgeons Congenital Heart Surgery Database from January 2010 to December 2015, reviewing information for nearly 27,000 minor patients nationwide. Within the study sample, they compared outcomes based on whether patients were intubated nasally or orally. In addition to the elevated risk of infection—including pneumonia, wound infection, mediastinitis, septicemia, and endocarditis—investigators found that nasal intubation was associated with prolonged intubation time and an extended length of stay postoperatively. A subanalysis of patients in the six-and-under age bracket, however, indicated a lower probability of infection from nasal intubation in children before six months of age. The finding suggests that nasal intubation may be beneficial up until then, at which time the researchers suspect that maxillary and ethmoid sinus development or development of adenoid tissue may harbor bacteria for nasal endotracheal tubes. In the youngest patients, meanwhile, nasal intubation appears to prevent accidental extubation. The study results were presented at the 2017 meeting of the Society for Pediatric Anesthesia/American Academy of Pediatrics Section on Anesthesiology and Pain Medicine. From "After 6 Months of Age, Infection Risk From Nasal Intubation Higher Than Oral"